Dear Outer Space: Chapbook Rookie: What Happened to Preorders?! 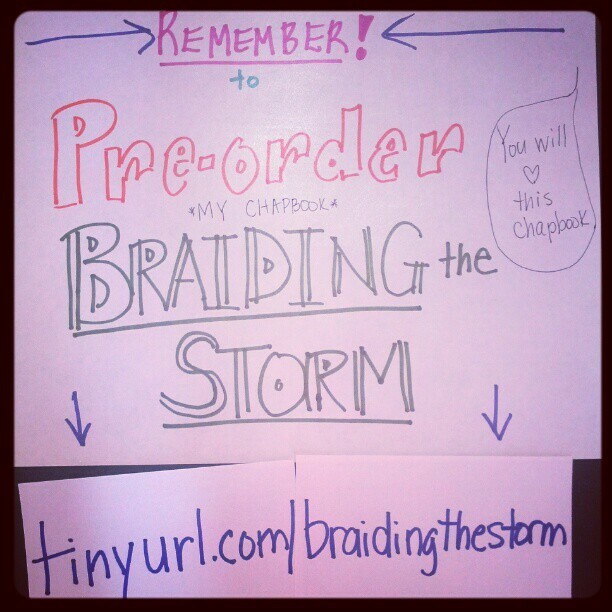 Chapbook Rookie: What Happened to Preorders?! Well, that went quickly. Turns out my pre-order period is just about finished. 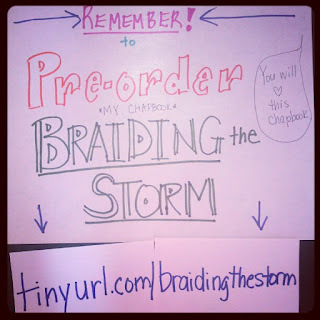 If you haven't bought a copy of Braiding the Storm yet, and you plan to, it'd be swell if you could grab a copy by this Friday, July 13th. Oh yeah, that's right. My pre-orders end on a Friday the 13th. Good thing I'm not superstitious. I have so much to say about chapbook marketing, but I won't be able to get to that until later. For now, I leave you with resources I've found useful thus far. So sorry to be late on this. Actually I was super early - but my order got eaten into the oblivion of preorder universe. So it just took me a while to re-pre-order. :) Love you and can't wait to read it!! thank you so much my friend! I miss you. I'm so out of the communication loop. Not been feeling like myself. Love you too - let's chat soon!